This is the last page of the first Spacefox book. What will happen to our hero now? I’m working on making Spacefox Minicomics. Keep an eye on this space for information on how to get them. Also, the CitK2 books should be ready soon. Same deal. Starbunny Inc is the latest offering from Dave Roman, who I discovered from his previous comic Astronaut Elementary. From all appearences, Starbunny takes place in the same universe, and even if it didn’t, it has the same sense of whimsy and nonsense video game logic that made AE so much fun. Curtailed is a semi-autobio comic about a couple who may or may not be a fox and ocelot in real life. They seem like a cool couple to hang out with. 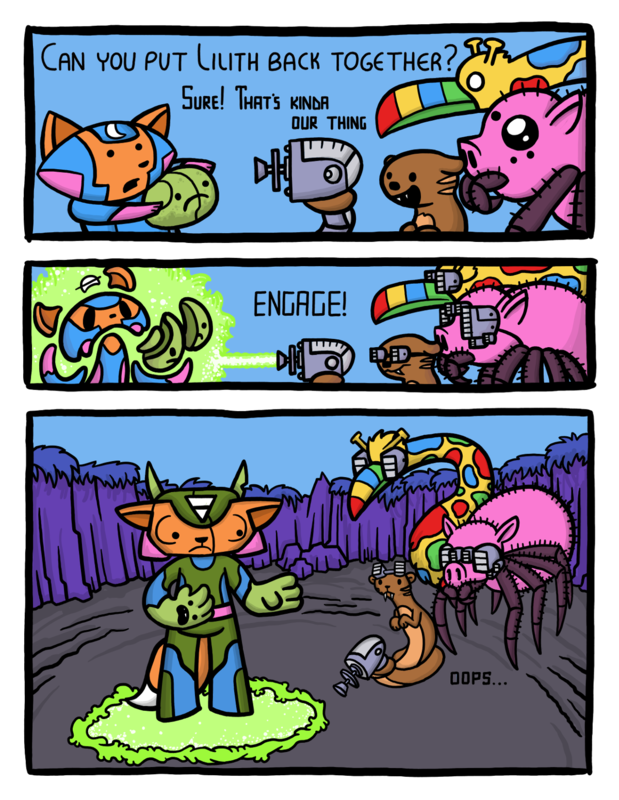 Commander Kitty is the fourth webcomic I ever discovered. * This is the second version of it, but the last one was a convoluted mess and the reboot was welcome, even if it did take nearly a decade. CK is a goofy scifi adventure, reminicent of a 90s Saturday Morning Cartoon, but without the episodes by writers who didn’t care about the show or its canon. Catena is another reboot of a comic I read forever ago. The current story focuses on the lives of normal-to-crazy 20-30 somethings, and has the potential to be an excelent sit-com-esque story. Still pretty new though. I like the lack of speech bubbles. It kind of adds to the simple complexity of the comic.